David MacGibbon and Thomas Ross, 1875, with alterations and additions by James Jerdan, 1889-90 (see Notes). 4-storey 5-bay tenement block with Scots Baronial details; former shops to ground floor and depressed-arched pend (Hunter's Close) to outer left. Squared and snecked stugged sandstone with polished dressings. Moulded cill courses at 1st and 3rd floors (stepped between windows at 1st). 2-leaf timber panelled door in 17th century-style surround (dated 1889 - see Notes) with relieving arch above to outer right; depressed-arched windows to former shops. Bracketed cornices to 1st floor windows; tabbed surrounds to 2nd; paired windows in crowstepped gables with truncated corbelled stack between; bipartite window to outer left; single windows above, that to 3rd in finialled gablet with small corniced stack to right. Built as lodging houses for the poor, with shops to ground floor. The MacGibbon and Ross plan shows a series of little flats with narrow corridors with doors to external cast-iron balconies linked to stair towers, with external WC's at each level. Each shop had a single storey top-lit saloon to rear. James Jerdan's alterations of 1889 show the space opened up and turned into long dormitories, by the use of cast-iron beams, and the building of one tall brick stair tower with a cistern room and 'director's room' at the top. 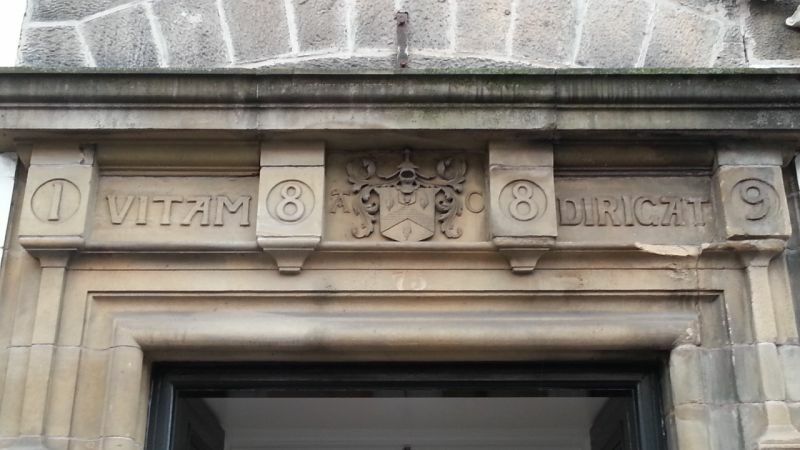 These alterations reflect the huge influx of immigrant labour (mainly from Ireland) in the later 19th century, many of whom ended up in the Grassmarket. The 17th century-style doorpiece (inscribed VITAM DIRIGAT in lintel) is by Jerdan. Restored 1998.